Already nearly halfway through winter. Time flies. The Imolc, the first of February, marks the halfway point between the winter solstice and spring equinox. It's a potent time, for me. This is a cold, dark time, but with such promise. Friday, January 27th: 11am-6pm, Faery Hair Friday at the Fernie Brae, 4035 SE Hawthorne, Portland, drop in! Wednesday, February 1st: 1st Wednesdays Faery Hair at Kyra's Bakeshop, 2-5pm, 599 A Ave, Lake Oswego, drop in, ask to get on the list! Friday, February 3rd: 11am-6pm, Faery Hair Friday at the Fernie Brae, 4035 SE Hawthorne, Portland, drop in! Friday, February 10th: 11am-6pm, Faery Hair Friday at the Fernie Brae, 4035 SE Hawthorne, Portland, drop in! Thursday, February 16th: 3-7pm, 3rd Thursdays Faery Hair (check back for location) Portland, drop in! Friday, February 17th: 11am-6pm, Faery Hair Friday at the Fernie Brae, 4035 SE Hawthorne, Portland, drop in! Friday, February 24th: 11am-6pm, Faery Hair Friday at the Fernie Brae, 4035 SE Hawthorne, Portland, drop in! 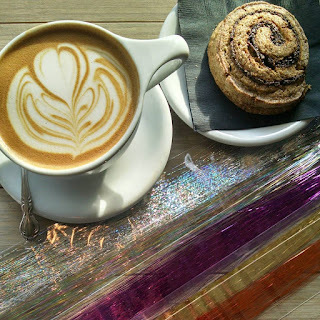 Wednesday, March 1st: 1st Wednesdays Faery Hair at Kyra's Bakeshop, 2-5pm, 599 A Ave, Lake Oswego, drop in, ask to get on the list! Friday, March 3rd: 11am-6pm, Faery Hair Friday at the Fernie Brae, 4035 SE Hawthorne, Portland, drop in! Friday, March 10th: 11am-6pm, Faery Hair Friday at the Fernie Brae, 4035 SE Hawthorne, Portland, drop in! Thursday, March 16th: 3-7pm, 3rd Thursdays Faery Hair (check back for location) Portland, drop in! Friday, March 17th: 11am-6pm, Faery Hair Friday at the Fernie Brae, 4035 SE Hawthorne, Portland, drop in! Friday, March 24th: 11am-6pm, Faery Hair Friday at the Fernie Brae, 4035 SE Hawthorne, Portland, drop in! Friday, March 31st: 11am-6pm, Faery Hair Friday at the Fernie Brae, 4035 SE Hawthorne, Portland, drop in! Brigid is a goddess of poetry, fertility, healing, and is a protector of domesticated animals. During Imolc we light candles to celebrate love, pregnancy, budding, creation, life. Make some art, love on your pets, tell someone you love them. All kinds of love are to be celebrated now: passionate love, friendship, kinship with animals, love of the earth and all of creation.